We saw this featured in a garden magazine and thought it was a wonderful idea. 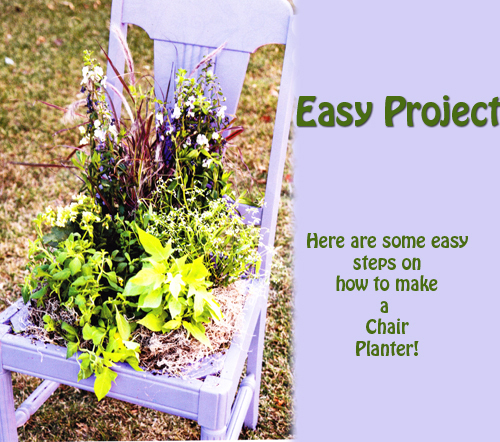 Take a plain flea market chair and turn it into a wonderful garden planter. The steps are listed below. Chair, screwdriver, primer paint and paint brush, clear acrylic sealer, chicken wire, staple gun and staples, spanish moss, potting soil, trowel and of course the fun part - garden plants. 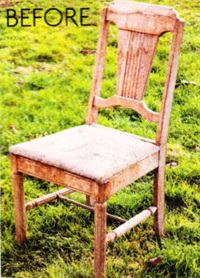 Remove the seat from an old dining chair with a screwdriver. If the seat is not removable use a jigsaw to cut a large hole into the seat of the chair. Next you can prime and paint the chair from. Of course this is a matter of choice and preference. We love the idea of using a bright bold color to add a bit of pizazz to any garden or patio area where you will want to display colorful plants and flowers. When dry, finish with a clear acrylic sealer to add durability. If you can find a sealer with a UV protectant in it then there is a better chance of the color not fading. Form a bowl shape from the chicken wire and staple it to the inside of the seat frame. Refer to the photos. Line the chicken wire frame with spanish moss and fill with potting soil. Now is the fun time where you select and plant colorful flowers or dark green plants. Include some trailing plants and tuck in moss to soften the edges of the chair seat. Water well! Seems like a fun and easy to do project. Let us know what you think. Read more.....It's now or never on bulbs! Read more.....How to plant a winter container.